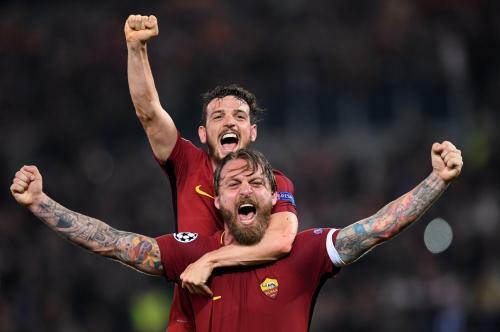 ROME – A phenomenal comeback saw Roma crush Barcelona 3-0 at the Stadio Olimpico to reach the last four of Europe’s premier competition for the first time since 1984. Practically written off after a heavy defeat in the first leg, the final whistle sent the Italian capital into euphoria on a historic night for the club. Prior to kick-off, the tie had been heavily weighted in Barcelona’s favour. Overturning a 4-1 deficit appeared unthinkable for many, let alone near impossible, against the Lionel Messi-led Spanish giants, still unbeaten in La Liga. The Giallorossi, however, were unfazed. In front of a storming atmosphere, and filled with plenty of belief, Roma quickly established a foothold in the tie as Edin Dzeko held off Samuel Umtiti and poked in his sixth minute opener. Seemingly overcome by the pressure, Barcelona wrestled to find their rhythm in an uncharacteristically shaky performance. Yet, their stuttering display, for the most part, wasn’t their own doing. Roma’s high-tempo, dynamic game plan was executed flawlessly, stifling La Liga’s runaway leaders as further chances began to emerge. Continuing his stunning start to the game, Dzeko won penalty midway through the second half as he was dragged down by Gerard Pique. A nerveless Daniele de Rossi appeared as the most composed man in Rome, confidently beating Ter Stegen, who had guessed the right way. Barcelona’s keeper produced a fantastic save as Roma continued to push. The German denied Stephan El Shaaraway from a couple of yards out as Barcelona just about kept their head above water. Roma, however, didn’t need to wait much longer. Aleksandar Kolarov’s corner in the 82nd minute was met by Kostas Manolas at the front post, who glanced a brilliant header into the far, bottom corner. The Greek defender rushed to the dugout amid the deafening uproar reverberating around the Stadio Olimpico. Fans suffered a few nervy moments towards the end but Di Francesco’s fearless players, ultimately, saw out the final few minutes as the stadium exploded, once again, at the final whistle. A superb Roma more than merited their win. Tears were aplenty as fans struggled to take in the events they had just witnessed. Wild celebrations ensued as the emotions began to pour out onto the streets of the Eternal City. Fans drove around the capital tooting car horns jubilantly and spontaneous street parties broke out in the popular Trastevere, Testaccio and Garbatella districts as the elation filtered into every corner of the city. Thriving as an underdog, Roma clearly fear no one. Fans will have Friday’s Champions League draw to look forward to, but for now at least, all attention remains heavily on celebrating a momentous night in the club’s history.